Late last week Above the Law posted a memo leaked from inside Clifford Chance (non-lawyers: that's a law firm, not a guy named "Clifford Chance") that they described as one of the most sexist memos they'd ever seen. At first glance, the memo doesn't seem to bear that out. It's just a list of presentation tips for younger associates, and a lot of the tips are pretty good ones. For example, there is no limit to the number of times people should be told NOT TO READ THEIR POWERPOINT SLIDES. DO NOT READ YOUR POWERPOINT SLIDES. NOT A LOT OF PEOPLE KNOW THIS BUT HELL IS ACTUALLY NOTHING MORE THAN AN ETERNITY OF BEING FORCED TO SIT IN UNCOMFORTABLE CHAIRS WHILE SATAN READS AN ENDLESS SERIES OF UNINTERESTING POWERPOINT SLIDES. So that's a pretty good tip. And nothing sexist about it. Most of the tips are similarly neutral. But then you get to the one about remembering not to "giggle." Well, some men do giggle—wait. Make sure the audience can't see up your skirt? Hm. 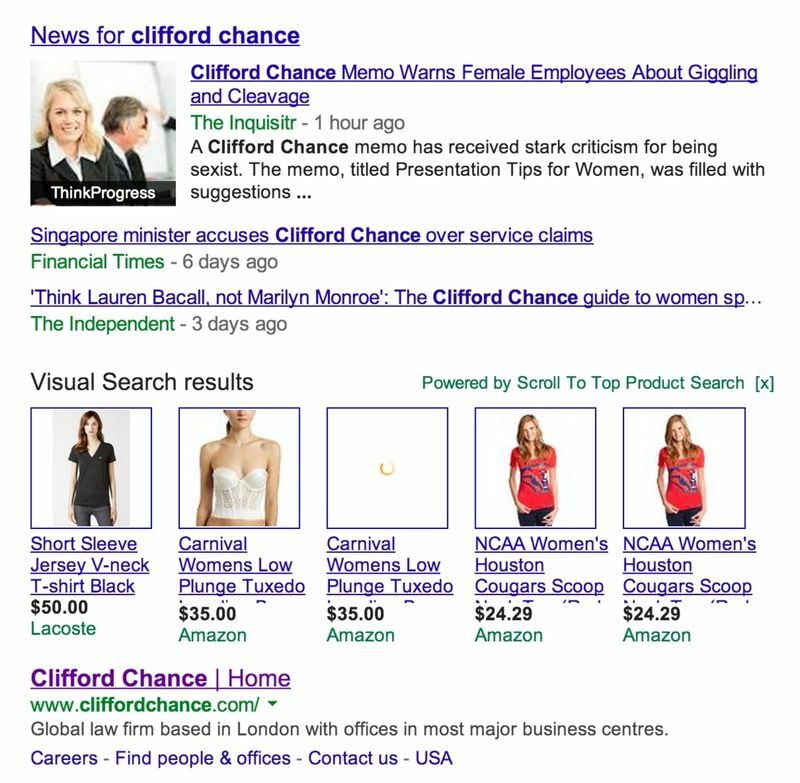 Does Clifford Chance have any locations in Scotland? Doesn't look that way, but maybe—oh. Don't show "cleavage," "make sure you can stand in your heels," and try to sound like "Lauren Bacall, not Marilyn Monroe." A broader issue with the memo is that, reportedly, it was presented by the firm's "Women's Committee" (which may or may not be comprised only of women) to female associates, and only to female associates, and the memo is said to have been entitled "Presentation Tips for Women." (The memo itself is untitled but this was likely the title of the presentation during which it was, perhaps unwisely, distributed.) This casts some of the facially neutral tips involved—such as, "practice hard words"—in a somewhat different light. Again, it might be a good idea for everybody to "practice hard words." Words is hard! Especially for people like law firm graduates who are thrust out into the world with a mere 19 years of education. But if you are only asking your female associates to "practice hard words," well, that's pretty bad. Clifford Chance provided a statement to ATL in response to the memo story, saying in part that "[t]he original presentation and associated tips represented a personal perspective, shared with a group of colleagues…. [T]here is no Clifford Chance template on how people should present. The offense caused by a small percentage of the suggestions in the tip sheet was entirely unintentional." That's almost certainly true, but doesn't address the issue of unintentional sexism, which is a thing, you know. Did you mean to search for "cleavage"? 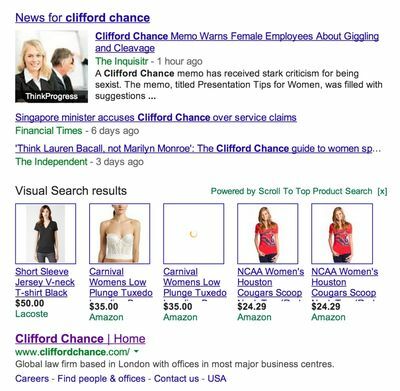 Google's more sophisticated algorithm does not associate the firm with cleavage this strongly, it appears. Maybe someone or something at Google actually read the memo and thereby knew that "low plunge" tops are not approved presentation attire at the firm. "Wear a suit, not your party outfit," it instructs.